Step one is to download and install the Google Adwords Editor. This is a utility published by Google to allow to work with Adwords on your computer and then upload your campaigns to Adwords. Google created this tool to reduce usage of the internet based Adwords interface. I personally recommend dowloading this tool even if you do not use the campaign creator. You will find it assists you maintain your campaigns in many ways. One great feature of the Adwords Editor allows you to import and export your campaigns. The purpose of this feature is to allow you backup your campaigns. You'll use it to create a whole campign from nothing, and import into Adwords. The Campaign Creator will create a file with an .aea extension. This is an "adwords editor archive" file. It is the exact same type and format the Adwords Editor uses to for exported campaigns. You import the .aea file into the Adwords Editor. Then you upload the new campaign to Adwords. 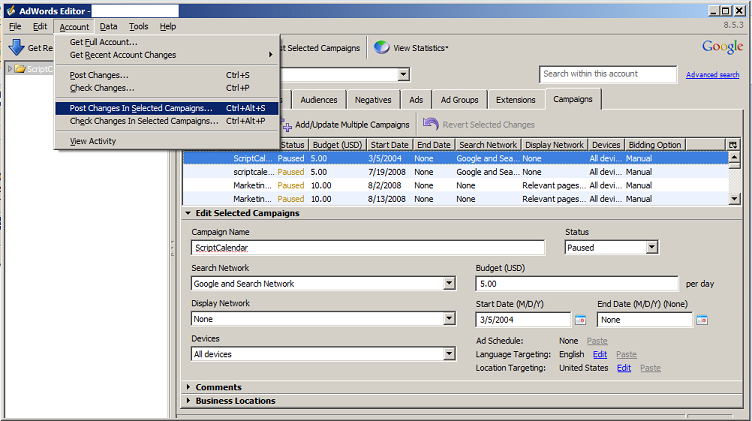 Alternatively, the Campaign Creator can generate the Excel data file for your campaign. The Adwords Editor allows you import archive or Excel files. So, the three basic steps for the campaign creator are list below. The instructions for the tool are on the Adwords Editor download page or in the quick start guide. Again, it has many useful functions. But, the only features we are interested in for now are importing a campaign and uploading a campaign. The import feature is found under the "file" menu and "import account snapshot". The upload feature is found under the "account" menu and "post changes in selected campaigns". The campaign creator works by taking an ad and merging it with every keyword on your list to generate a unique ads for each keyword. In addition, each landing page should unique so that you have a targeted page for each keyword. To make the ads and destination urls unique, you'll need to insert the keyword into the ad. The tool allows you to use tokens that get replaced with the keyword as the ad is generated. You can use these tokens in the headline, description, display url and destination url. The following table demonstartes the various tokens you may use. [dash] the current lowercase keyword with dashes subsituted for spaces. This is useful for Url Rewriting. Please note the case is important when using tokens. For example imagine you are selling furniture and you have the keywords "oak table" and "cherry table". You could write a sentence such as "Find Great Deals on [KeyWord]s" in the tool. 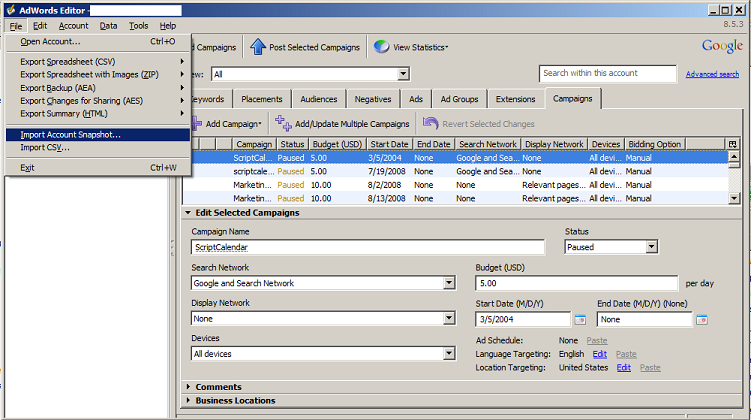 When the campaign is generated, it will create an adgroup and ad for each keyword. The token will be replaced with the keyword as the ad is created. The "oak table" ad will have the sentence "Find Great Deals on Oak Tables". The "cherry table" ad will have the sentence "Find Great Deals on Cherry Tables". This is similar to dynamic keyword instertion (DKI) in Adwords. The important difference is that the campaign creator tokens are replaced before the campaign is uploaded. You are not uploading campaigns DKI. Instead, you are uploading plain text since the replacement happens before the upload. This is an important distinction. Adwords obvisiously recognizes DKI tokens. It specifically says DKI tokens do count as relevant when calculating a quality score. Your ad might as well be unrelated or garbage, since you will not achieve a good quality score. However, with the campaign creator you are uploading plain text. Adwords will recognize the plain text keyword in the headline, description or urls. You will get credit for relevance when calculating a quality score. The main components of an Adwords Campaign are the ads and keywords. The goal is to achieve a high keyowrds and ad releveance. You do that by having one adgroup per keyword, and an ad targeted to that keyword. On the campaign creator form, you'll need to fill in the various fields. They are described below. Ad Group Dropdown Create multiple ad groups. You want to create mutliple adgroups. Max CPC Bid Currency You'll set the Max CPC at the Ad Group level, not on the individual keywords. This Max CPC will be applied to each Ad Group created. Check length after replacement Checkbox Use this checkbox to indicate that the headline, descriptions and urls should be checked for a valid length after tokens have been replaced with keywords. When this is checked, all your keywords and ads must meet the maximum length rules within Adwords. You may uncheck this, and then check the maximum lengths inside the Adwords Editor. Ad Headline Text Here is the headline for you ad. It will be repeated for every ad group. The "[keyword]" in the textbox will be replaced by the current keyword, so that you can mention the keyword in the ad. It is recommended that the headline be the exact keyword. Description Line 1 Text Here is the first line of you ad. It will be repeated for every ad group. Again, The "[keyword]" in the textbox will be replaced by the current keyword, so that you can mention the keyword in the ad. Description Line 2 Text Here is the second line of you ad. It will be repeated for every ad group. Again, The "[keyword]" in the textbox will be replaced by the current keyword, so that you can mention the keyword in the ad. Display Url Text Enter your domain here. Adwords expect the display url to match the domain of the destination url. You do not need the leading "http://"
Destination Url Text Enter the url of your landing page here. Include the "http://". The generator expects you to use Url Rewriting, so you can use dynamic keyword insertion or "[keyword]" or "[dash]" tokens in the url. The generator will replace these with the keyword, or keyword with dash for spaces. Match Checkbox Check each keyword match options you want for each keyword. You can use all three or any combination. Keywords Text Enter your keywords. Just like Adwords, enter one keyword or phrase per line. Output Dropdown Choose to generate an Adwords Editor Archive (.aea) or Excel (.xls) file. When you click the generate button the Campaign Creator will create an adwords editor archive (.aea) file or an Excel file for you. Save the file to your computer. The Campaign Creator prompts you to save your data before generating your campaign. A red warning message appears when you modify campaign settings in the tool. This red warning message asks you to save the campaign settings before generating the campaign. Saving the campaign settings is useful if you want modify previously saved settings, or perhaps recover from an error condition. Saving your settings eliminates the need to re-type data. Choosing the "save XML" button downloads and xml file (.xml) to your computer. The file contains the campaign settings you have entered. Save the file on your computer in a location you will remember. You may load an xml file containing your cmapaign settings data using the "load XML" button. First, browse to the xml file on your computer. Then click the "load XML" button to load the settings into the tool. Your settings will load into the tool.